It’s hard enough to deal with loosing Sydney, but now she may lose her best friend, too. And even if she manages to patch things up with Sarah-and figures out what to do about Chase-she still must face a daunting decision: is she strong enough to take on another service puppy? Sheri S. Levy’s magazine article about a Diabetic Alert dog, Scent with Love, was published in Clubhouse Magazine in July, 2010. This story was nominated for a Maxwell Medallion Award with the Dog Writers Association of America’s competition and received the Special Interest award at their February 2011 awards banquet in New York. As a member of the Society of Children’s Book Writers and Illustrators (SCBWI) Carolinas, Sheri helps coordinate critiques and has written for their regional newsletter and for the Southern Breeze region. In addition to teaching a six-week Creative Writers Club after school hours for elementary students, Sheri also volunteers with an accredited, non-profit service dog kennel, Palmetto Animal Assisted Life Services (PAALS). Sheri and her husband have enjoyed many years of married life, and their two children have become remarkable adults; their two grandchildren are very special readers. She has loved five past dogs and now owns two Australian Shepherds. Find out more about Sheri at her website, www.SheriSLevy.com, or Facebook page. 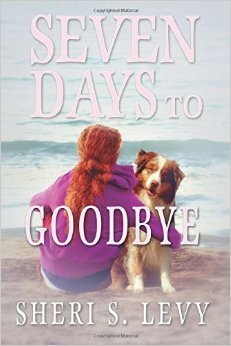 To purchase your own copy of Seven Days To Goodbye on Amazon, buy HERE.